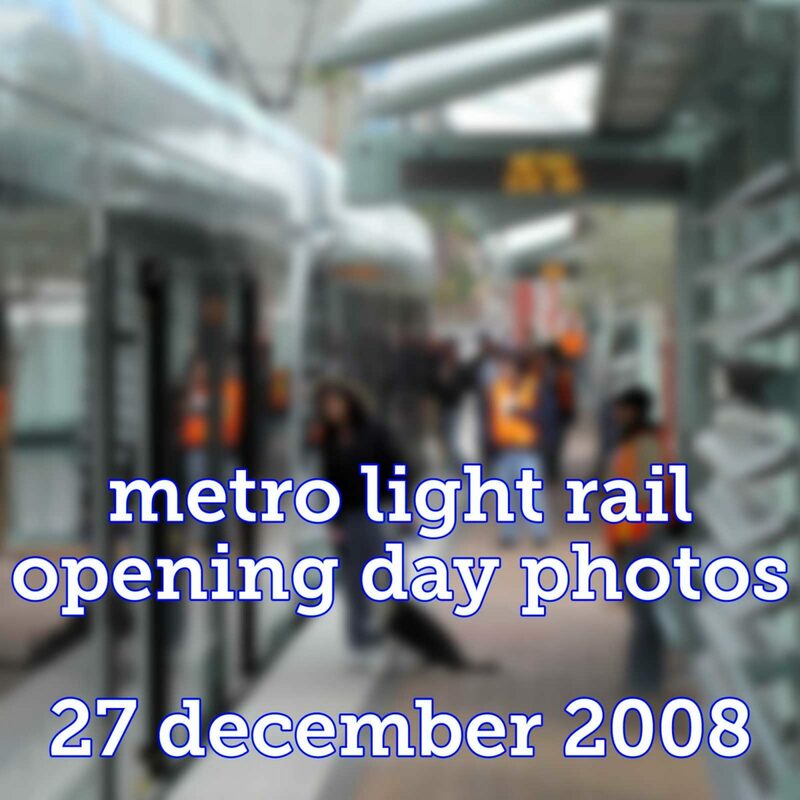 Today marks the 10th anniversary of METRO light rail’s inauguration. In celebration of METRO at 10, relive the day with some photos. Ten years ago today (27 December 2008), Phoenix made history. It had opened the first part of its new METRO light rail (WBIYB) connecting many different parts of our community. The initial system was touted to be the starter line of a system that would spread tentacle-like throughout the Phoenix metro area, linking commercial corridors, cultural institutions, residential communities, sports arenas, and educational opportunities to each other. While the promise of METRO is under attack by reactionary anti-transit individuals upset by the proposed extensions into south Phoenix (my take: Build the damn train! ), it’s a system that has transformed our city and tried to make us somewhat relevant in the global city-driven economy. To mark METRO’s 10th anniversary, here are some photos I’ve unearthed from the archives of the opening day festivities. 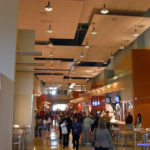 Phoenicians will also recall that it was also on this day that the new North Building of the Phoenix Convention Center was also opened to the public. 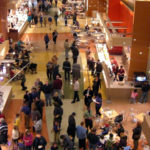 Downtown Phoenix, 27 December 2008: Phoenicians walk through Metro Marché, the food court of the new Phoenix Convention Center North Building, at its opening day festivities. 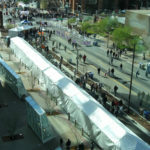 The Phoenix Convention Center’s North Building and METRO light rail were opened on the same day. 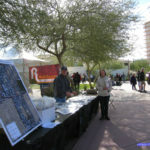 Midtown Phoenix, 27 December 2008: The Midtown Museum District Neighborhood Association holds court at the Heard Museum on METRO light rail’s opening day. Today, the Midtown Museum District is now known as the Midtown Neighborhood Association. Midtown Phoenix, 27 December 2008: A Midtown resident and her dog curiously inspect the first train to arrive at the Encanto/Central Ave (Heard Museum) station. Service was officially inaugurated at 10:00am. Downtown Phoenix, 27 December 2008: The new North Building of the Phoenix Convention Center was also open to the public on 27 December 2008. A skyway links the West Building to the North Building. The Friday Five for August 29: More public transportation improvements for Phoenix. 1. Get rid of the $2 bus tax; reintroduce transfers. 2. Designate high-capacity / high-frequency routes. 3. 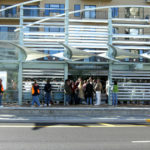 Retrofit existing light rail stations with cooled spaces; shade all bus stops. 4. Have bus system achieve schedule parity with light rail. 5. Introduce stored-value fare cards for all riders. 6. Connect transit to trailheads. I’ve written on this extensively in an essay comment from Monday so I will refer you to that for more detail. In summary, if we want to alleviate parking problems at some of our most popular parks, trails, and mountain preserves, we must think about different ways to get people there. I propose connecting our bus system to those trailheads. 7. Establish site guidelines for bus stop locations, especially during construction. 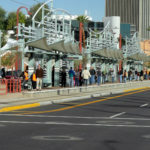 Especially in central Phoenix, bus stop locations can be located quite a distance from the intersection they serve. For instance, the eastbound Thomas Road bus stop is 250 feet from its corner, which doesn’t include any street crossings needing to be made by passengers. During construction, as we are seeing on 19 Ave for light rail’s extension, bus stops can be 1/8 – 1/4 mile away from the intersection and can constantly change. When transfer times are in the 1-2 minute range instead of 5-6 minutes and especially in unshaded environments, bus connections are missed. Guidelines should be created and enforced (especially during construction) that bus stops should be no more than 100 feet from the intersection. 8. 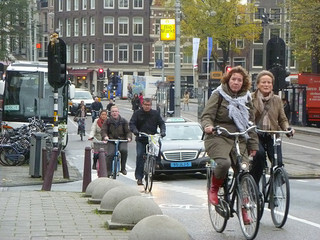 Improve bicycle infrastructure on buses, trains, and at major stations. Public transportation is a great way to get from point A to point B without having to pedal everywhere. Most times when I ride the train, the hanging bike racks are full. Often times, too, bicycle racks on buses are full. (Trains can hold four bicycles per car; a bus can hold two or three bicycles.) Bicycles are not allowed on the bus so if a bicycle rack is full, a rider has to wait or cycle to their destination; on trains, when the bike racks are full, bicycles and their riders are blocking aisles and doors. As METRO orders new rolling stock for its system and evaluates its current equipment, more bicycle racks are certainly an imperative! Something that’s equally important is the addition of practice bicycle racks at major transit centers. I can’t tell you how many people I’ve seen try to load their own bicycles into the trains with bad results. I know that I’ve had problems loading my own bicycle into the hanging bike rack. “Practice makes perfect,” as the saying goes, and I am sure that some practice bicycle racks at major transit centers would provide some no-pressure/no-stress practice for both novice and experienced transit users alike. 9. Update schedules with real data. More often than not, there is a disconnect between what the schedule says and when the next bus or train arrives. On a recent bus trip, the schedule was off by 10 minutes. Trains are usually off by 1-2 minutes. As Valley Metro updates their schedules for the future, perhaps they should add this experiential information and realize that while schedules are nice, they are often aspirational. 10. Make Valley Metro data, including real-time positions, truly open source. We’ve heard that Valley Metro is in the process of creating their own in-house app for bus and train schedules, route guidance, and general information about the system. While their limited release of GTFS data is welcome, why not make it open source for everyone? 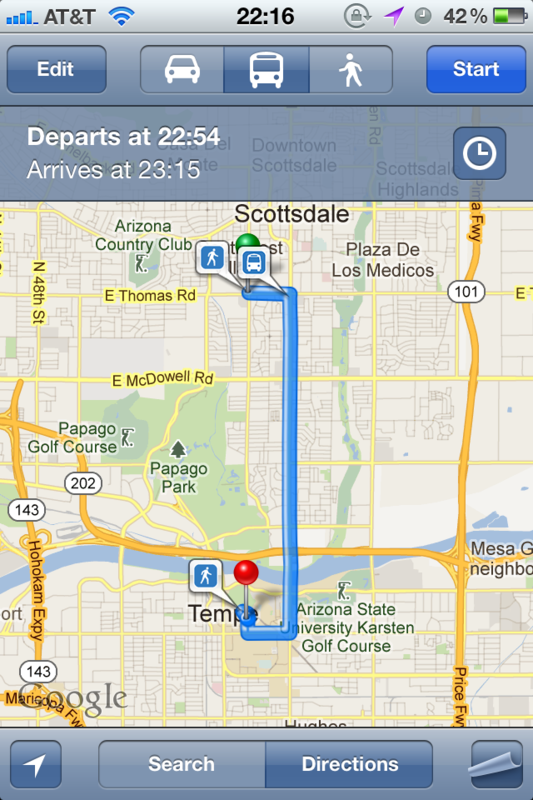 There are great mobile apps for getting transit directions, many often times better than Valley Metro’s own website. In addition, some of these apps contain GTFS-Realtime information, meaning directions are based on realtime bus and train positions, not predetermined schedules. An easy fix to alleviate parking problems at Phoenix’s most beloved parks and preserves: create a Transit to Trailheads program. There’s been much debate and political posturing over the discussion to make parking at Phoenix’s mountain preserves paid instead of free. 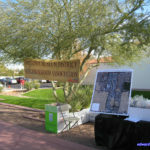 While, certainly, this is to look at making up some much needed revenue in Phoenix (something economic development would do much better, but that’s a different essay), it’s also to look at alleviating parking problems at some of the more popular preserves, like Camelback Mountain and Echo Canyon. 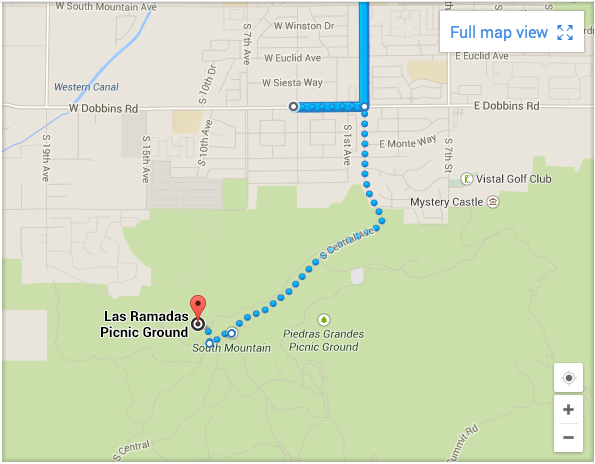 I’m in favor of this plan at some of our most popular preserves, like Piestewa Peak and Camelback Mountain. One of the criticisms of this plan is that residents of the City of Phoenix already pay for these preserves so we shouldn’t be charging to access them. The logic is flawed because while we pay for most city-maintained infrastructure like water or trash, we have to pay an additional monthly service fee for what we use. Parking at a popular preserve is just that: paying for what we use. There is a way around this, something that hasn’t been mentioned in the discussion: How about giving Phoenix residents a free or discounted season parking pass for these preserves? It is, after all, Phoenix residents and property owners footing the bill to help maintain these spaces, not the residents of Paradise Valley, Scottsdale, or anywhere else. It’s a shame that as other cities around the world are starting to think about connecting places without the need for cars, we can’t think that far ahead yet here in Phoenix. Three words: Transit to Trailheads. Write your Councilperson to have them support this plan. The (Almost) Friday Five: Some thoughts on public transportation improvements in Phoenix in light of City Hall’s push to collect our feedback. 1. Get rid of the $2.00 bus fare tax and reintroduce transfers. At the moment, it costs $4.00 to purchase an all-day pass except if you’re on a bus, where it’s $6.00. While the reason given was that it is to encourage riders to purchase their passes and tickets at transit centers or third-party retailers, there is no practical reason to keep it. An all-day pass should be the same price no matter where it is purchased. Conversely, the two-hour transfer should be reintroduced because our bus system is designed around Phoenix’s grid streets system. 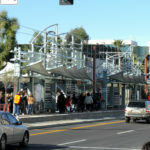 To get from one point to another on bus or light rail, there is a great chance that you’ll need to take two (or more) bus lines or connect from bus to train. 2. Designate high-frequency routes and increase service and capacity. 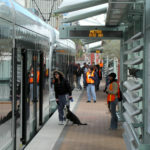 When METRO light rail opened after Christmas 2008, it ran one train every ten minutes between 7am and 7pm on weekdays. Today, the headway is 12 minutes between trains on weekdays, with less frequent service outside of those times. For buses, a quick glance at the schedule shows that the most frequent line is the Thomas Road line, Route 29, which achieves a 10-minute headway during weekday morning and afternoon commutes. Using ridership data, Valley Metro should identify these routes with high ridership and create a high-frequency service promise for these core lines. 3. Retrofit existing light rail stations with cooled spaces and put shade at all bus stops. Train and major bus stops in many Midwestern cities have adapted quite well to the extreme cold that comes their way by installing heated areas on platforms and stations. Having traveled to some of these places during the winter, it is very welcome for this native desert dweller whose idea of cold is anything beneath 50º F! While I know that physics and electromechanical engineering state that it’s easier to heat than to cool, the number 1 hallmark of a great city is adapting to climate. We’ve created two light rail platforms in downtown Phoenix that have cooled spaces. Let’s make them all have cooled spaces. In addition, let’s put shade at all bus stops. Too many bus stops are just a sign with no shelter from the heat. We live in a desert; it gets hot here. Let’s adapt to our warm climate. 4. Have the bus system achieve schedule parity with light rail. Right now, the last city buses leave downtown Phoenix around 10:15pm on weekdays and 9:00pm on the weekends. Meanwhile, the last light rail trains leave at 11:30pm Sunday through Thursday and 2:30am late night on Friday and Saturdays. Bus service needs to be enhanced to match light rail or light rail service needs to be cut back to match bus services because the two methods complement each other. 5. Introduce stored-value transit fare cards for all riders. Washington’s WMATA has SmarTrip. New York City’s MTA has the Metrocard. Boston’s MBTA has the Charlie Card. In Minneapolis, they have the GoTo Card. All of these cards are reusable cards that have combinations of stored value and day / week / month unlimited-ride passes for bus, subway, or commuter rail. These cards can be purchased by anyone from a vending machine or a station agent. Phoenix doesn’t have that system and it’s long past time we have something like that. Our closest thing is the Platinum Pass but that’s only for companies through trip-reduction programs. Paper tickets for various passes are available. If we want to make public transportation a truly viable and equal option for urban dwellers as we want it to be, a stored-value card program available to the masses has to be introduced. Many of us with iPhones in Phoenix received a mobile emergency alert yesterday. Learn about your options to disable them if you want. 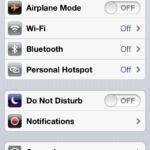 You can turn off these alerts on your iPhones if you want to do that. (I am neither saying you should or shouldn’t!). To do that, go to Settings and tap Notifications. 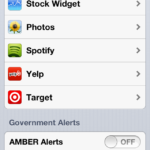 At the bottom of the screen is a section titled “Government Alerts.” At the moment, you can select to enable or disable AMBER alerts and Emergency Alerts. With the Monsoon season having started in earnest in Phoenix, warnings for dust storms are very prevalent. You’ll be getting a lot of these notices if you keep them on — just be prepared for them. …in which I weigh in on some good news: Young people are driving less! I received this lovely bit of news from Arizona PIRG: Youth are driving less. Long live cities! A new report released today by the Arizona PIRG Education Fund demonstrates that Americans have been driving less since the middle of last decade. The report, Transportation and the New Generation: Why Young People are Driving Less and What it Means for Transportation Policy, shows that young people in particular are decreasing the amount they drive and increasing their use of transportation alternatives. Transportation and the New Generation reveals that for the first time since World War II, Americans are driving less. The report showed that by 2011, the average American was driving 6 percent fewer miles per year than in 2004. This trend away from driving is even more pronounced among young people. The average young person (age 16-34) drove 20 percent fewer miles in 2009 than the average young person in 2001. The report also notes that a growing number of young Americans do not have driver’s licenses; from 2000 to 2010, the share of 14 to 34-year-olds without a license increased from 21 percent to 26 percent. “America’s transportation preferences appear to be changing. Our elected officials need to make transportation decisions based on the real needs of Americans in the 21st century,” concluded Unrein. Take the bus and let someone else worry about the driving. Then, while you’re riding, make a movie! Here’s another cool advantage of taking public transport: you can make movies and let someone else worry about the driving! This is a cool video from London called, aptly, a “London Bus Tour.” Enjoy!